You are currently browsing the tag archive for the ‘two old sweeties’ tag. Accepting things as they are is an excellent path to contentment. Horses are much better at this than humans. We continue to believe we’re in control. We scurry around trying with all our might to change things, sometimes only ending up exhausted or alienated from the people or situations we are trying to control. I’m not suggesting that we shouldn’t improve our lives. Of course we should. We go to school, we learn new skills, we take risks, we dream, we act, we grow. What I am suggesting is that it’s a bit of a dance on the razor’s edge–knowing when to act and when to surrender. A few days ago when I was out feeding the Golden Girls, the wind began to blow, bringing with it a flurry of snowflakes. The temperature dropped rapidly as the snow began to stick. Pepper and Chickadee knew exactly what to do. They turned their butts to the wind and continued eating, scarcely missing a beat. Then I pulled on hat and gloves, muttering all the while. I allowed the weather to influence my mood–and not for the better. I wasn’t living in the present moment, but rather wishing for something that wasn’t going to happen. At least right then. It’s March in Colorado, for goodness sakes. The experience reminded me (yet again) how I sometimes allow my mood to be affected by things over which I have absolutely no control. It takes practice to learn the fine art of surrendering to what is. All I can say is that I’m working on it. And with my two sweet old teachers, I have great role models. Our boarding facility was recently sold to new owners. Chickadee belonged to the previous owner who didn’t know what to do with her when she left the property. Who wants a thirty-two year old mare? Chickadee and Pepper have become fast friends–the Golden Girls. Everyone around the facility has taken a shine to the two old gals. They get extra hay and quite a lot of attention, which makes my heart happy. 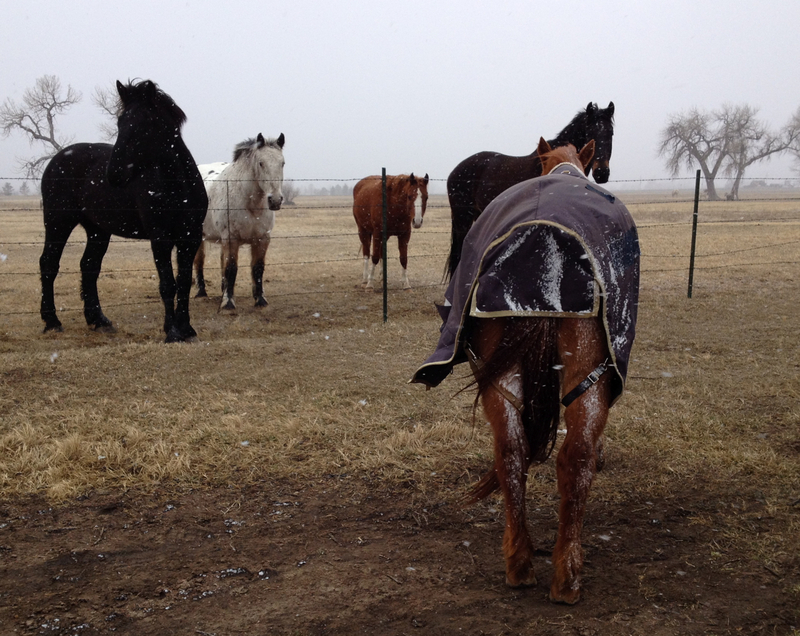 My husband has long harbored a dream of running a rescue program/retirement center for senior horses. I guess we’re doing it one horse at a time. Chickadee is a sweet-tempered girl, so grateful for the extra feed, the warm coat we wrap her in, and our attention. She’d been literally put out to pasture, and was doing okay, though not great. Already she seems to be thriving as part of our herd. Seems we’re destined to still be caring for two old sweeties. Welcome to the family Miss Chickadee! As you may recall, each Wednesday for a while I’m opening up our family photo albums to give you a peek at our lives with our two old sweeties. And who is that handsome man? Look closely and you’ll see those darned nose hairs! The physical ones seem especially hard to accept. 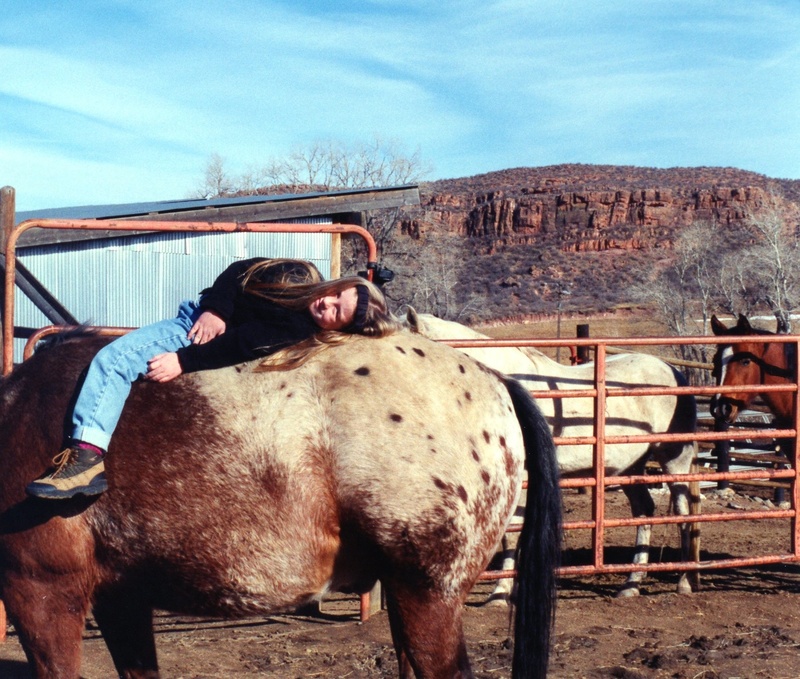 Horse or human, when your body doesn’t work as you’ve come to count on, it’s not so easy. In the horse world you often lose your ranking. Younger, stronger horses dominate a herd where you once were the alpha pair. You feel more vulnerable. You spend your time trying to stay out of the way of the young studs. You want to be left alone to eat your hay and hang with your peeps. There’s very little drama and you like it that way. One aspect of the aging process is that our bodies go a little wacky when it comes to hormones. It seems we have too few or too many. And what is it with hair? You lose it in the places you want it, and get it in places you don’t. That my friends, does not seem one bit fair. 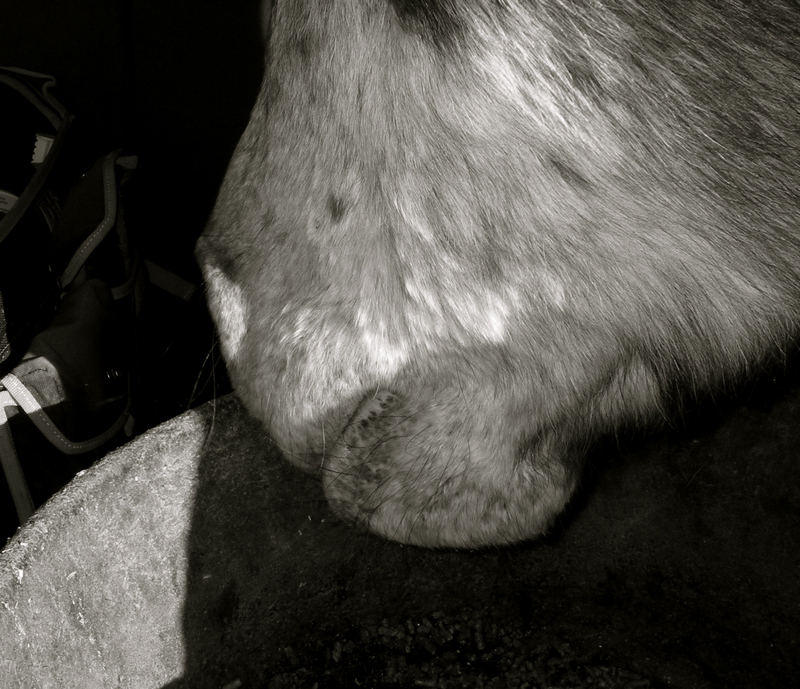 On Sunday as we were out feeding our two old sweeties, the angle of the sun landed across Bud’s face just right. For the first time I saw long hairs sprouting from the side of his nose. One was so long it actually draped over the edge of the feed pan. At first I was confused – was I looking at a piece of spider web? It was Bud’s nose hair. Those random hairs seem to take on lives of their own. Know what I’m talkin’ about? And if you don’t, give yourself a few decades. It will become abundantly clear! I Never Saw a Horse Do That! Apparently we’ve become something of an attraction at the boarding facility where Bud and Pepper live. On Sunday we were out feeding our two old sweeties, like we do every day. 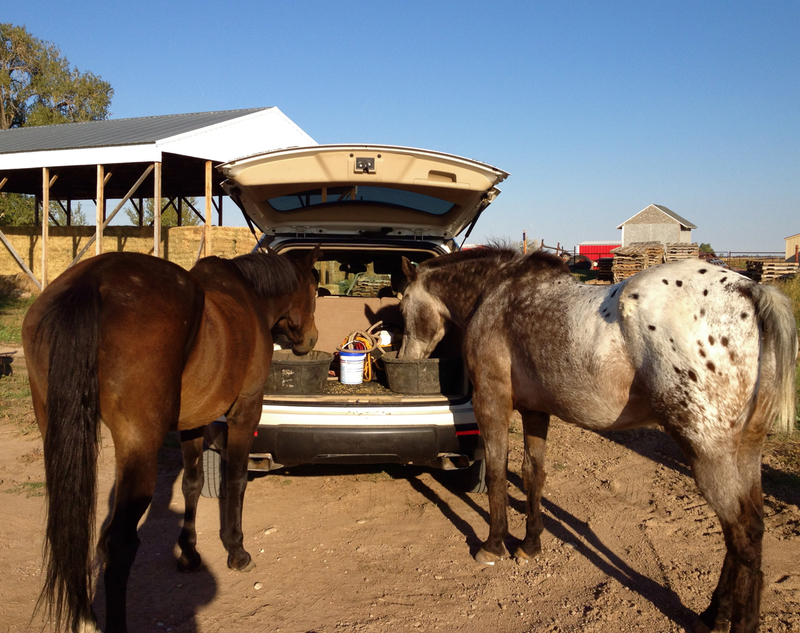 We’d loaded up their feed in the back of our SUV. 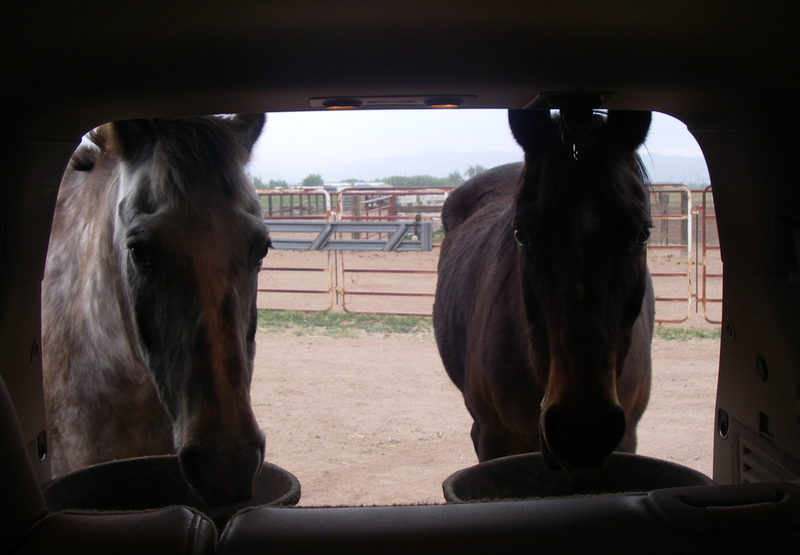 When we arrived, we pulled into our regular parking spot, opened up the back of the vehicle, and let Bud and Pepper out. They were waiting for us at the gate, like usual. They bellied up to their feed pans and began munching away. We were reveling in the blue sky, warm air and all round gorgeous autumn afternoon. We saw three people walking down the road toward us, but didn’t think anything about it. We figured they were coming to pull a horse out of the pasture. Instead, they stopped by the two old sweeties and asked if they could take some pictures. “We heard about this, but couldn’t believe it,” the woman said. Then Bud and Pepper started showing off. One at a time they walked up to the fence post where we keep the bucket of alfalfa cubes. We call it the dessert bar. 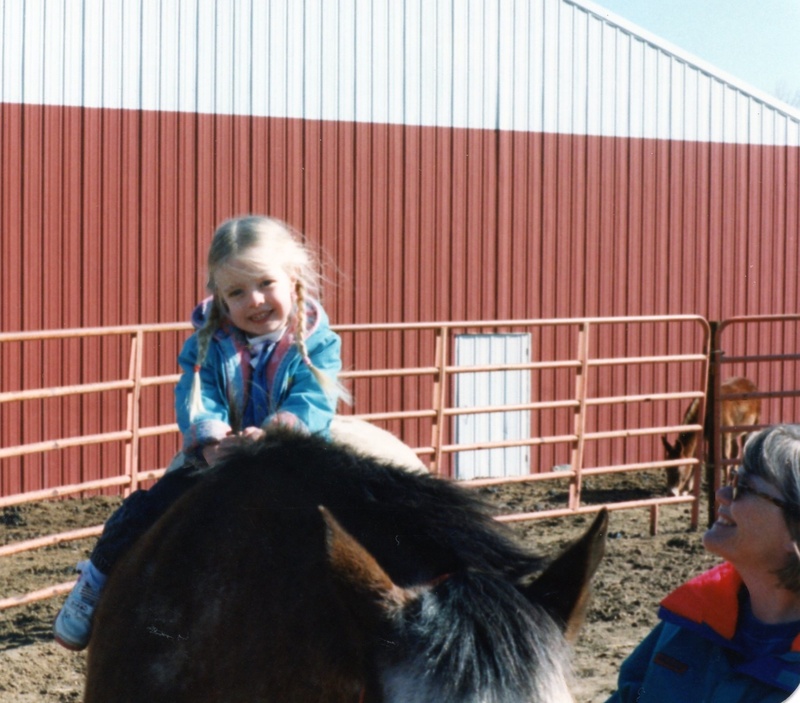 No halters or lead ropes, of course. They munched their cubes and then with just a little reminder, they walked to the pasture gate and when we opened it up, they walked in. Click, click went the camera. After they left, we laughed about the whole interaction. Glad we could offer a bit of entertainment for some out of town visitors on a gorgeous Sunday afternoon. So tell me this: Do you do things with your animals that observers might find odd, interesting, or unusual? Time is a fluid thing – abstract and complex. I’m grateful for the structure and predictability the calendar provides. Do this particular thing on this day. It’s how most of us get things done, remember important dates, and function in the world. Days pass into months, which in turn pass into years. But in addition to the calendar, (or maybe in spite of it) I measure time in terms of my relationships. “I’ve known this person since our children were babies,” I’ll say. Relationships with people and places are how I really note the passing of time, and it’s hugely comforting. 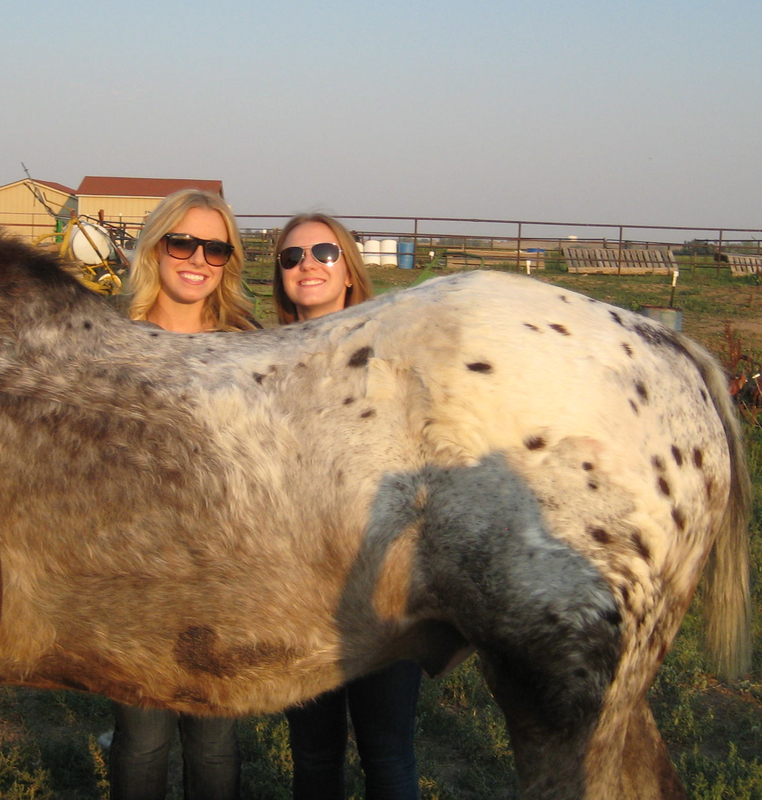 This summer our goddaughters visited the pasture to catch up with Bud and Pepper. We’ve known these beautiful girls from the time they took their first breaths, and have loved them ever since. As I watched them saying their hellos to Bud and Pepper on this warm summer evening, I remembered the many times they’ve spent with our two old sweeties. 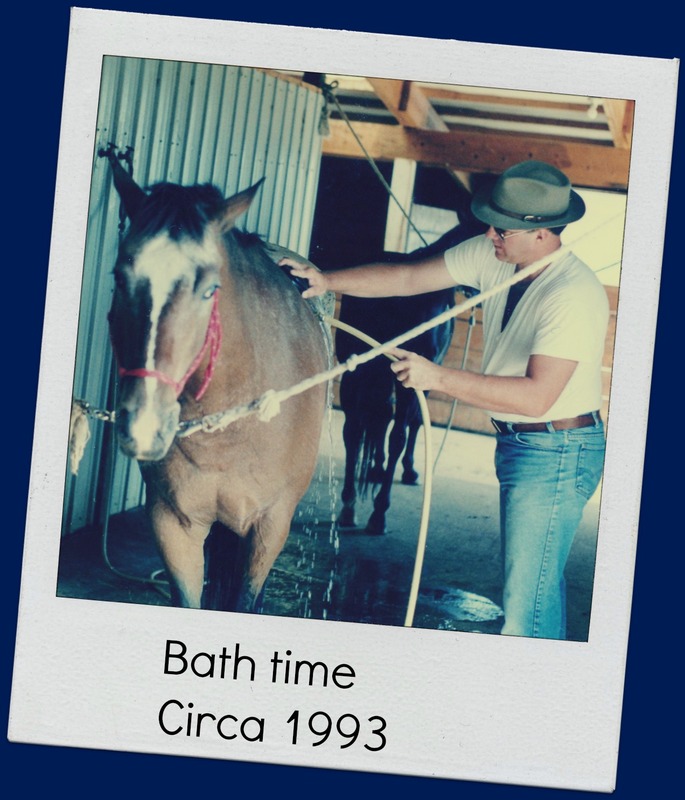 We have wonderful memories of visiting the horses, riding in the round pen and barn, grooming, giving baths, handing out treats, and just soaking up that good horse energy. Instead of being separate events, they string together in my mind like a ball of twine growing larger with each visit. What would you put in your bottle? It seems our summers are taking on a predictable pattern. That is if you can count two years in a row as a pattern. The other night when we went out to feed our two old sweeties, I had to walk into the pasture to find them. That was surprising, since they are almost always right at the gate waiting for us. 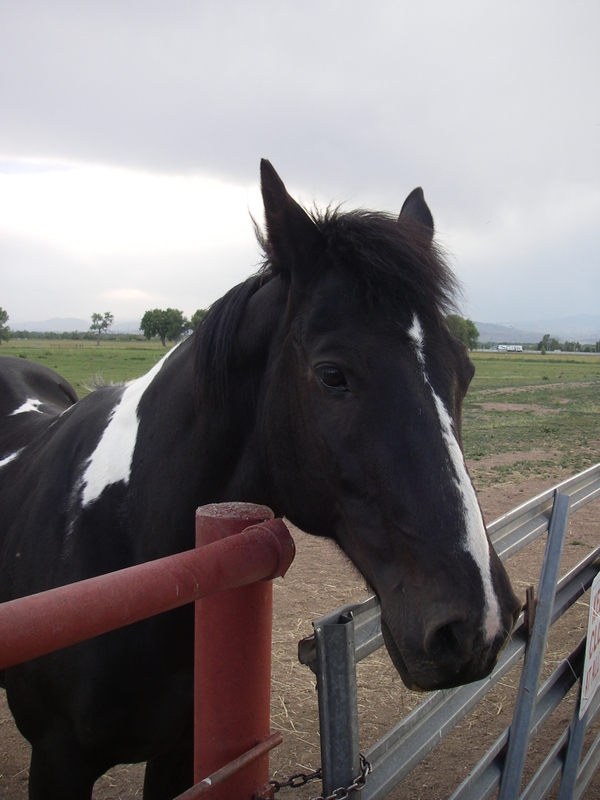 a young black and white Paint gelding. Miss Pepper has a new boyfriend. Apparently, our thirty-year-old mare is hot stuff in the pasture. The three watched me approach. At first I didn’t get it. I thought they were just hanging out together. I called and they looked right at me, unmoving. I’m something of a slow learner! The deal is, Bud was NOT about to leave Pepper with this interloper, this intruder, this disrespectful young whippersnapper. No matter how badly he wanted his dinner, he stayed with Pepper. Eventually, they decided a pan of grain sounded pretty good. Pepper broke out and took the lead, Bud followed, and pulling up the rear was the Paint. He’s young and new to the pasture, and frankly the Herd of Oldsters is somewhat of a safe place to ease into the herd. No one chases you off. Or kicks the you-know-what out of you. As long as you mind your manners, they accept you. But really, did he have to conscript my mare? He couldn’t just use the Oldsters as a stopping point on his way into the herd? Amigo and Red want nothing to do with him. 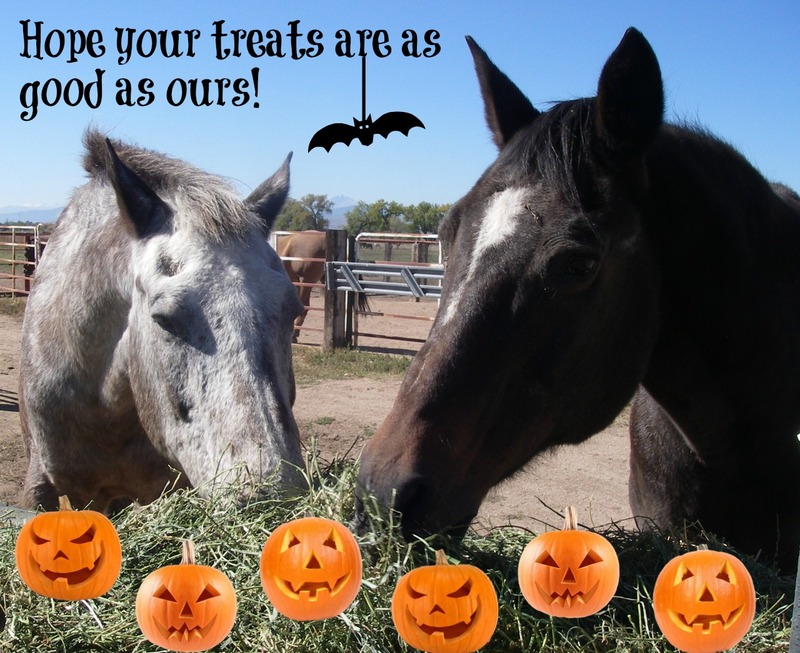 They didn’t come for their treats, which is quite unusual. 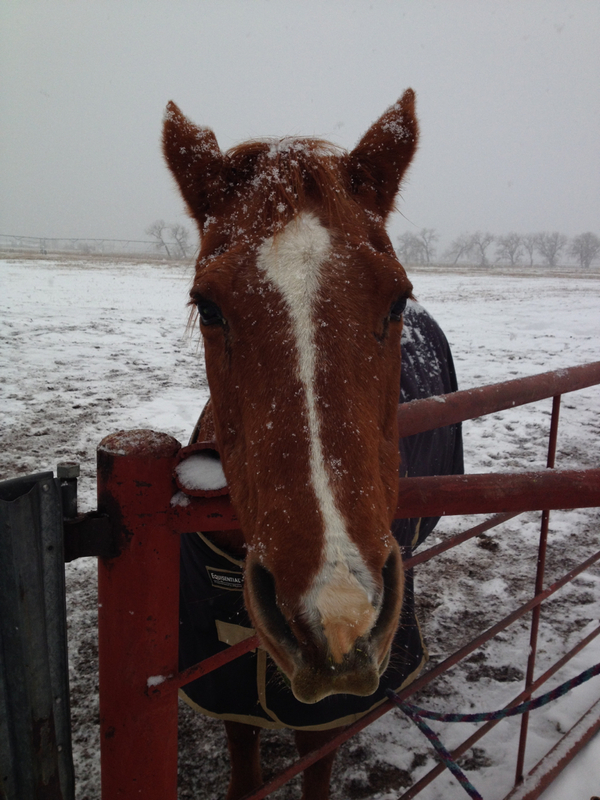 Red, our resident Mustang, seems especially disgusted. This as of yet unnamed Paint is a handsome boy. And I expect he’s a nice enough horse. To his credit, he’s accepted Bud. And there’s been no kicking – at least not that we can see. If you recall, last year, Fred was much more aggressive. He hurt Bud and we did NOT like him at all. We were extremely relieved when that affair ended and Fred left the pasture. 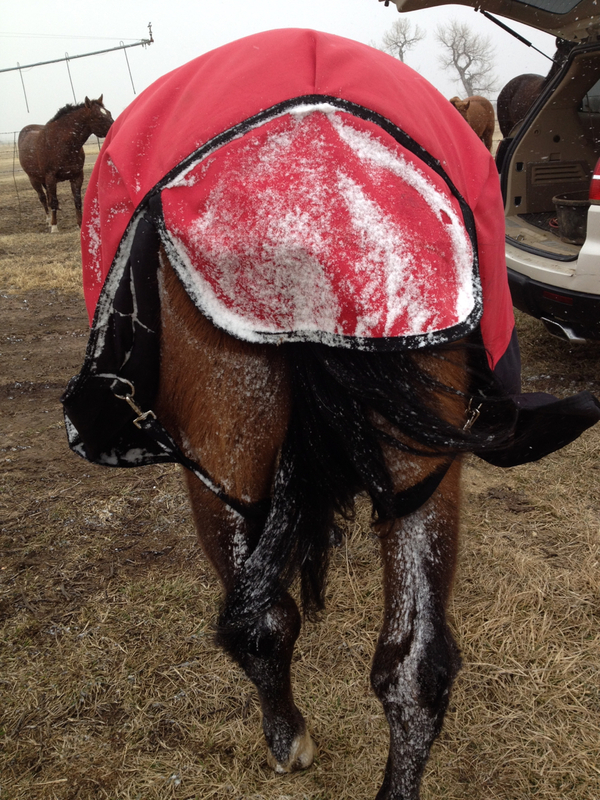 “Don’t let the gate hit you in the rear end on your way out,” was our comment when he left. And now we start again. As the Pasture Turns, Season Two. We’re in a dry spell here in northern Colorado. The ground is hard-packed and unyielding to my dandelion digger. And oh my goodness, it’s been dusty out at the pasture. It started raining somewhere around four-ish and continued through the night. Still raining the next morning. Short term it’s going to make a huge difference to gardens; to pasture grass, and to the dandelions. I’m thinking green, lush and tall. 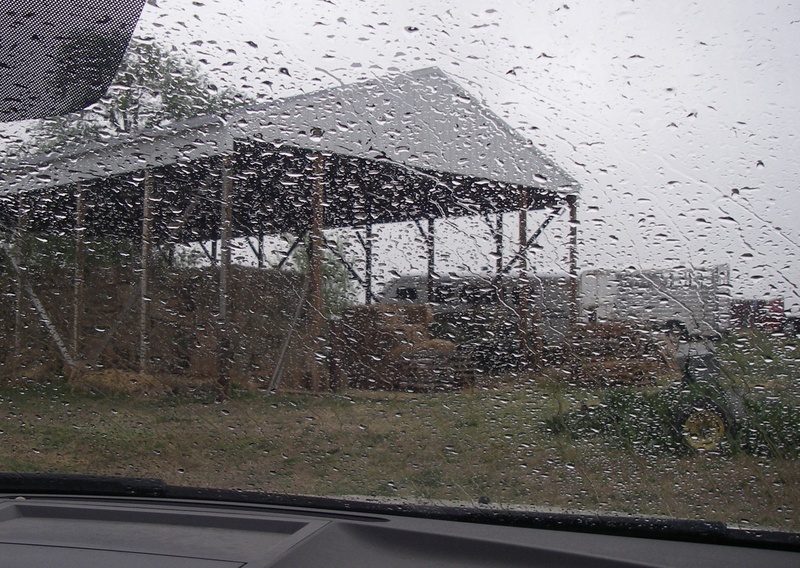 Here’s what it looks like when we feed in the rain. Our two old sweeties get a canopy of sorts to keep the rain out of their feed pans and off their heads. The back of the car takes on the nutty-sweet aroma of grain. And we get the comfort of sitting in the car. 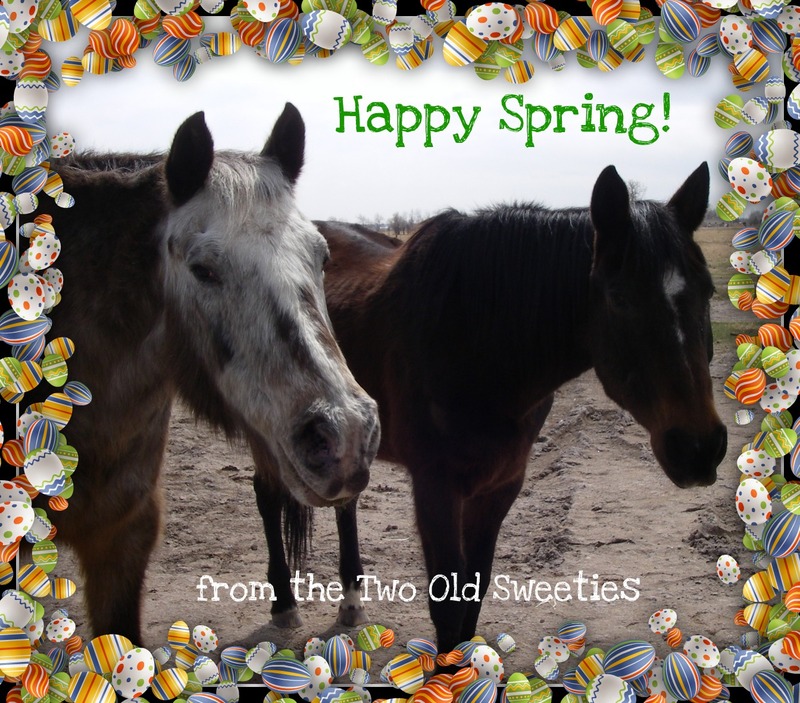 At least until it’s time to return a couple of satisfied horses to the pasture. They seem to know it’s not a time to dilly-dally. Maybe they have the comfort of the shed on their minds. Just another day at the pasture! We want to take a moment to thank you for being our loyal follower.